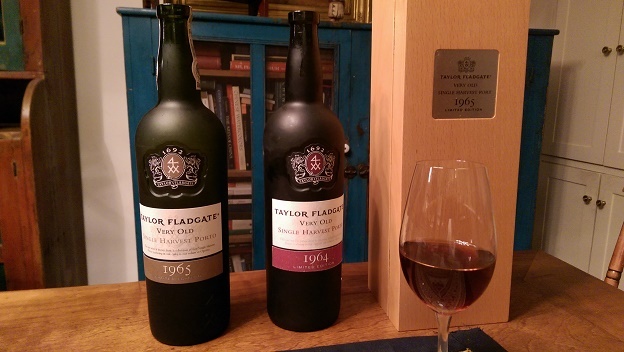 Taylor’s 1965 and 1964 Very Old Single Harvest Ports are a half-century old but the 1965 was just released and the 1964 is still available on retail shelves. If you’re looking for a 50th-birthday gift for a relative, friend or business associate born in 1965—a year that was literally a washout for claret and red Burgundy—you probably can’t do much better than the newest release from Taylor. Taylor has one of the deepest reserves of very old cask-aged Ports and launched this new project beginning with the 1964 in January of 2014. These are rare ports from a single harvest that are aged in casks until being bottled and released. The decades of aging in wood have resulted in an essence of port through controlled oxidation and steady evaporation that has concentrated the wine. One of the reasons I find these two wines so fascinating is that they have very different profiles—unlike, say, Taylor’s 40-year-old tawny, which is a blend of vintages made to maintain a consistent house style. You can serve great old tawnies with nuts or a nut tart or crème brûlée after a meal, but I prefer drinking them on their own, slightly chilled, with good company. These wines are officially priced at close to $300, but I’ve seen them listed for as little as $250.